TP-Link high performance Smart Managed Switches have been designed to cope with the rigours of business, with enterprise-level QoS, useful security strategies and rich layer 2 management features they are geared for growth while ensuring performance and reliability. What’s more, the easy-to-use web management interface means faster setup and configuration with less downtime. 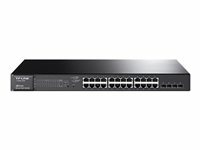 For more application of layer 2 switches, T1500-28PCT supports a complete lineup of layer 2 features, including 802.1Q tag VLAN, Port Isolation, Port Mirroring, STP/RSTP/MSTP, Link Aggregation Group and 802.3x Flow Control function. Any more, the switches provide advanced features for network maintenance such as Loop Back Detection, Cable Diagnostics and IGMP Snooping. IGMP snooping ensures the switch intelligently forward the multicast stream only to the appropriate subscribers while IGMP throttling & filtering restrict each subscriber on a port level to prevent unauthorised multicast access. In a world of expanding enterprises and growing virtualisation, cloud-based services and applications, like VoIP, HD streaming video, and IP surveillance, SMB networks need to evolve beyond simple reliability to provide increased scalability, higher bandwidth, and enhanced performance. TP-LINK’s new T1700X-16TS Full 10-Gigabit Smart Switch provides high levels of performance, scalability, and cost-effectiveness that SMBs require from their 10G networking solutions, representing an ideal solution that meets these requirements. Until recently, 10-Gigabit connectivity was available only in the expensive fibre based technology that supports high-speed access to the network backbone or data centre environment. Today, 10GBase-T Technology is becoming more common and affordable. Low-Latency, Line-Rate 10G Copper Base-T is backward compatible with Fast Ethernet and Gigabit Ethernet and can automatically negotiate between higher and lower speed connections. Most importantly, 10GBase-T provides a cost-effective method for migrating from your current network to 10G Ethernet by utilising your existing CAT5e/CAT6 RJ-45 short connections (up to 55m) and CAT6A/CAT7 connections (up to 100m). This reduces cabling complexity and ultimately results in significant savings for customers. The T1700X-16TS supports IP-MAC-Port Binding, Port Security, Storm control, and DHCP Snooping, which help to protect the network from broadcast storms, ARP attacks, and more. The Access Control List (ACL, L2 to L4) feature restricts access to sensitive network resources by rejecting certain packets based on the MAC address, IP address, TCP/UDP ports, and VLAN ID of both the source and destination. And the switch supports 802.1X, which allows network clients to be authenticated through external Radius servers and the guest VLAN function allows non-802.1X clients to access specific network resources. To support voice, data, and video services on one network, the switch utilises rich QoS policies. Administrators can prioritise traffic based on a variety of factors, including Port Priority, 802.1P Priority, and DSCP Priority, to ensure that voice and video streams are always clear and smooth. The T1700X-16TS is easy to use and manage. It supports various user-friendly standard management features, such as intuitive web-based Graphical User Interface (GUI), industry-standard Command Line Interface (CLI), SNMP (v1/2/3), and RMON. This allows the switch to provide valuable status information and send reports on abnormal events. Comprehensive IPv6 support management ensures a smooth migration to an IPv6-based network. It also supports Dual Image to provide improved reliability and network uptime. The T1700G-28TQ supports rich L2 features, including 802.1Q tag VLAN, Port Isolation, Port Mirroring, STP/RSTP/MSTP, Link Aggregation Groups, and 802.3x Flow Control function. Additionally, the switch provides advanced features for network maintenance, such as Loop Back Detection, Cable Diagnostics, and IGMP Snooping. IGMP snooping ensures that the switch can intelligently forward the multicast stream only to the appropriate subscribers, while IGMP throttling and filtering restrict each subscriber on a port level to prevent unauthorised multicast access. Besides, T1700G-28TQ supports L2+ feature: static routing, which provides simple network segmentation by routing internal transmissions to make the flow of network traffic more efficient. 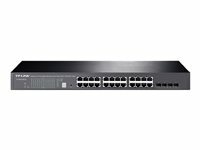 For more application of L2 switches, T1600G-52TS supports a complete lineup of L2 features, including 802.1Q tag VLAN, Port Isolation, Port Mirroring, STP/RSTP/MSTP, Link Aggregation Group and 802.3x Flow Control function. Any more, the switches provide advanced features for network maintenance such as Loop Back Detection, Cable Diagnostics and IGMP Snooping. IGMP snooping ensures the switch intelligently forward the multicast stream only to the appropriate subscribers while IGMP throttling & filtering restrict each subscriber on a port level to prevent unauthorised multicast access. Moreover, T1600G-52TS supports L2+ feature - static routing, which is a simple way to provide segmentation of the network with internal routing through the switch and helps network traffic for more efficient use. For more application of layer 2 switches, T1500G-10MPS supports a complete lineup of layer 2 features, including 802.1Q tag VLAN, Port Isolation, Port Mirroring, STP/RSTP/MSTP; Link Aggregation Control Protocol and 802.3x Flow Control function. Any more, the switches provide advanced features for network maintenance such as Loop Back Detection, Cable Diagnostics and IGMP Snooping. IGMP Snooping ensures the switch intelligently forward the multicast stream only to the appropriate subscribers while IGMP throttling & ?filtering restrict each subscriber on a port level to prevent unauthorised multicast access. TP-Link JetStream Gigabit Smart Switch T1500G-8T is equipped with 8 gigabit RJ45 ports and port 8 can receive power from PoE Power Sourcing Equipment (PSE). The switch provides high performance, enterprise-level QoS, useful security strategies and rich layer 2 management features. For more application of layer 2 switches, T1500G-8T supports a complete lineup of layer 2 features, including 802.1Q tag VLAN, Port Isolation, Port Mirroring, STP/RSTP/MSTP, Link Aggregation Control Protocol and 802.3x Flow Control function. Any more, the switches provide advanced features for network maintenance such as Loop Back Detection, Cable Diagnostics and IGMP Snooping. IGMP Snooping ensures the switch intelligently forward the multicast stream only to the appropriate subscribers while IGMP throttling & filtering restrict each subscriber on a port level to prevent unauthorised multicast access. T1500G-8T is easy to use and manage. It supports various user-friendly standard management features, such as intuitive web-based Graphical User Interface(GUI) or industry-standard Command Line Interface(CLI). SNMP (v1/2/3) and RMON support enables the switch to be polled for valuable status information and send traps on abnormal events. For more application of layer 2 switches, T1500G-10PS supports a complete lineup of layer 2 features, including 802.1Q tag VLAN, Port Isolation, Port Mirroring, STP/RSTP/MSTP, Link Aggregation Control Protocol and 802.3x Flow Control function. Any more, the switches provide advanced features for network maintenance such as Loop Back Detection, Cable Diagnostics and IGMP Snooping. IGMP Snooping ensures the switch intelligently forward the multicast stream only to the appropriate subscribers while IGMP throttling & filtering restrict each subscriber on a port level to prevent unauthorised multicast access.